Recent precipitation has caused Prior Lake to reach its Ordinary High Water level of 903.9 feet. Prior Lake is now under a slow no-wake restriction. Spring Lake is below its Ordinary High Water level of 912.8 and not under a slow no-wake restriction. Boaters are being asked to voluntarily travel at slow no-wake speeds. City Public Works staff has installed “Slow No-Wake” restriction signs at both public Prior Lake boat launches. The “Save Our Shores” signs remain at the Spring Lake public launch. Sandbags and sand are now available at the City Maintenance Facility. for more information and watch the City’s website for additional updates. hand-shovel it from the bin (please do not use mechanical equipment). Ready for a Friday FISH FRY! WHAT’S THE STATUS of the carp seine? The commercial fishermen were at it again today, throwing out their nets in Crystal/Mud Bay in hopes of capturing a large amount of carp. 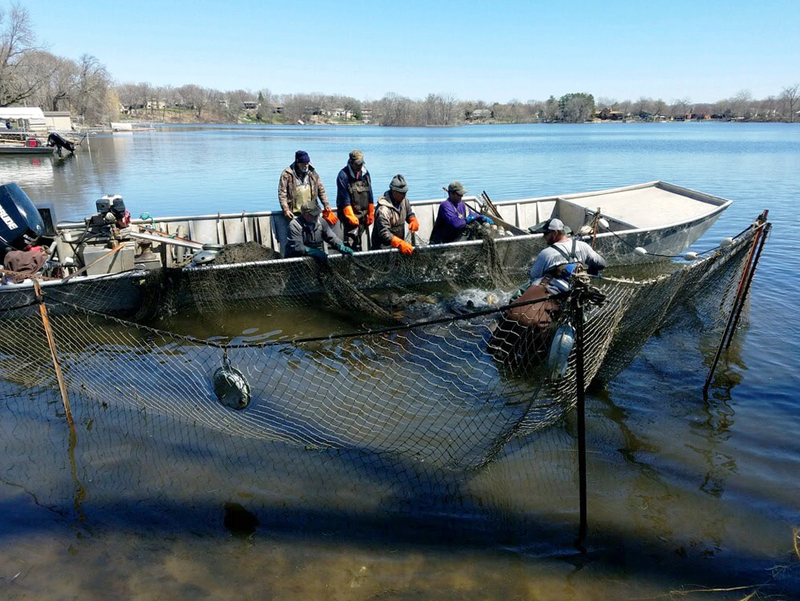 They successfully netted an estimated 3,000 pounds of carp which brings the week’s total to about 8,000 pounds of carp! IS THERE STILL MORE CARP TO CATCH? Yes, but the commercial fisherman are calling the seining effort this week solid work and are hanging up their hats (for now). 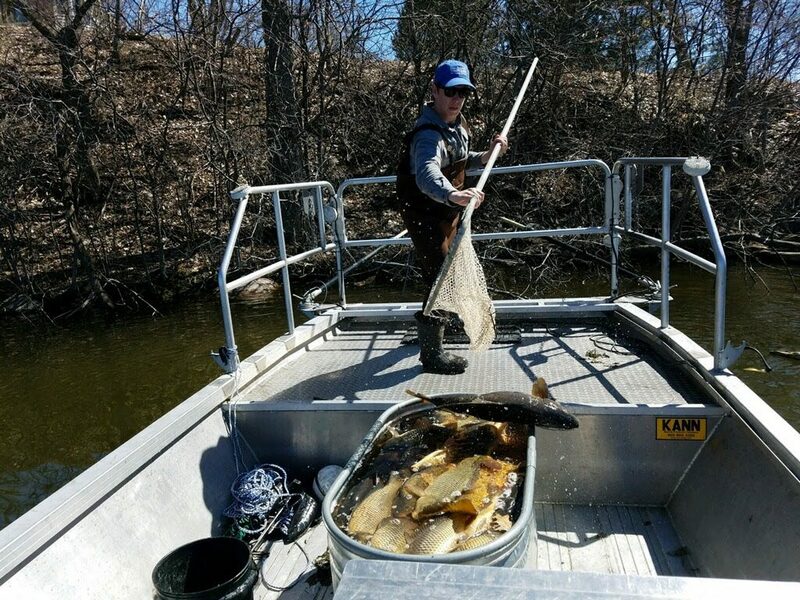 There is a LOT more carp in Upper Prior Lake that we need removed to meet our water quality goals, and the Watershed District will be working with the commercial fisherman again later this year to complete additional seines with help from our carp consultants at WSB. The commercial fishermen “cribbing” up the group of captured carp. WHERE DO THE CARP GO? The semi truck has been rescheduled and will now be out at the boat launch on Sunday to transport the carp to markets down south where they are used to stock commercial game ponds. If anyone would like to see how the carp are loaded up onto the semi, they are welcome to join us at the boat lunch bright & early on Sunday morning! DO I STILL NEED TO STEER CLEAR OF MUD BAY? There are two areas in Crystal/Mud Mary where the captured carp are being held, one group is netted up into a “crib” and the other is in an underwater net bag with a two signs near it waning residents to “KEEP OUT”. Please use caution on the south and west shorelines of Crystal/Mud Bay(see map below). CAN I PUT IN MY DOCK? If your property is in Crystal/Mud Bay and is not near the netted carp areas on the west and south side of the bay, please feel free to put in your dock. However, please remember to use caution when driving boats along the shoreline. HOW CAN I GET UPDATES ON THE PROJECT? Keep checking the website or email mkarschnia@plslwd.org to be added to our email update list – we’ll send out updates as we learn more! In addition, you can feel free to give us a call at 952-447-9808 if you have any immediate questions or concerns. Jeff Anderson from PLSLWD netting some carp for the haul. A group of carp has been located in Mud Bay (a.k.a. Crystal Bay) and the commercial fishermen were lined up to come seine the area. 4-16-19 Update: The commercial fishermen worked hard today to pull their nets through the muddy bottom in Crystal Bay (a.k.a. Mud Bay). They ended up netting an estimated 5,000 pounds of carp, but this was a lot less than the 30,000 pound haul they were anticipating. 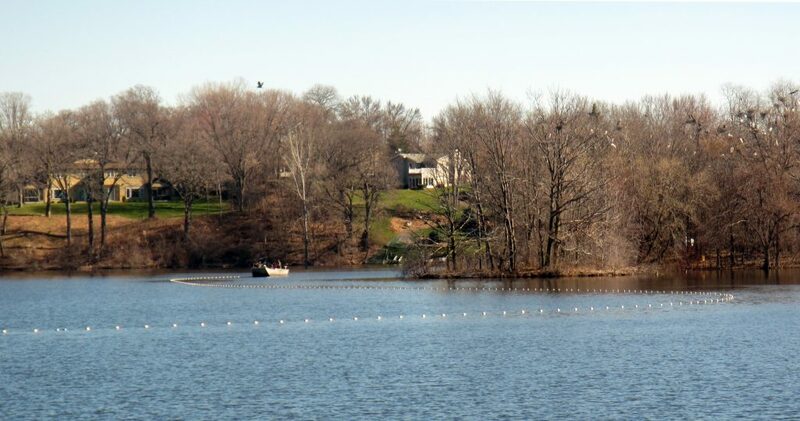 The carp will stay netted at the location overnight until they are ready to be removed from the lake later this week. Luckily the noise and netting didn’t scare the carp out of the bay and the commercial fishermen would like to take another shot at a seine tomorrow. We’re hoping that the second time is the charm! Please DO NOT use boats, or recreational watercraft in Mud Bay (Crystal Bay) until the carp have been removed. Any activity or loud noises in this location could scare the carp out of the seine area and make removals less successful or prevent the seine from happening entirely. If you would like to watch the netting and removals, please do so from the public roads or join us at the Upper Prior boat landing later in the week to see the carp get loaded up onto the semi-trailer. 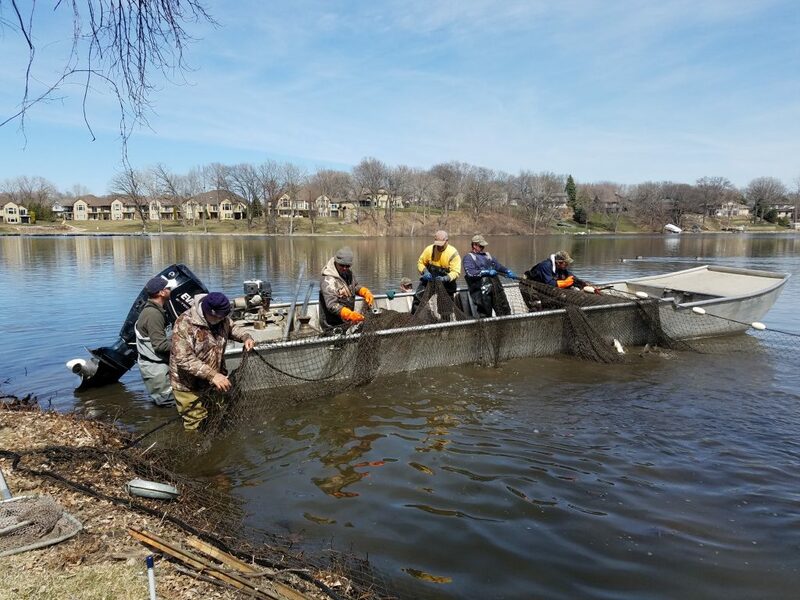 Visit the 2019 Carp Seine Updates page for more updates and our Facebook page for photos and videos from the seine as we get them. 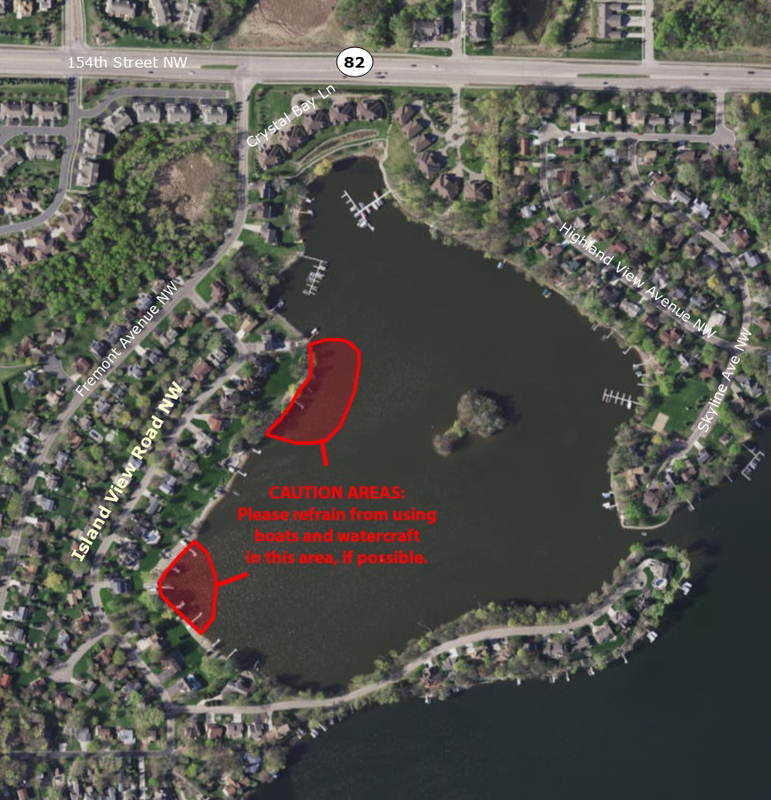 The City of Prior Lake, in accordance with its Flood Response Policy, has already initiated several flood response measures this year to address high water levels on Spring Lake and Prior Lake. Both lakes remain high due to the recent spring snowmelt event and spring rains. Fluctuating Lake levels can be expected as we see new precipitation work its way through the Spring Lake/Prior Lake system. The City remains prepared to initiate and deactivate flood response measures as lake levels change and pass certain trigger points. Water continues to leave the system through the Prior Lake Outlet Channel. Lake levels can be found on the PLSLWD website. Our lakes will be losing their ice cover soon. In anticipation of this annual event, and with continued high water levels, City public works staff has installed the “Save Our Shores” signs at our three public boat launches on Spring Lake and Prior Lake. Boaters are asked to voluntarily travel at slow no-wake speeds as shoreline damage from waves can be more severe when the water level approaches, but does not exceed, mandatory slow no-wake levels. If lake levels increase and a slow no-wake condition is triggered, the City will post an update on its website and change the signs at all launches.